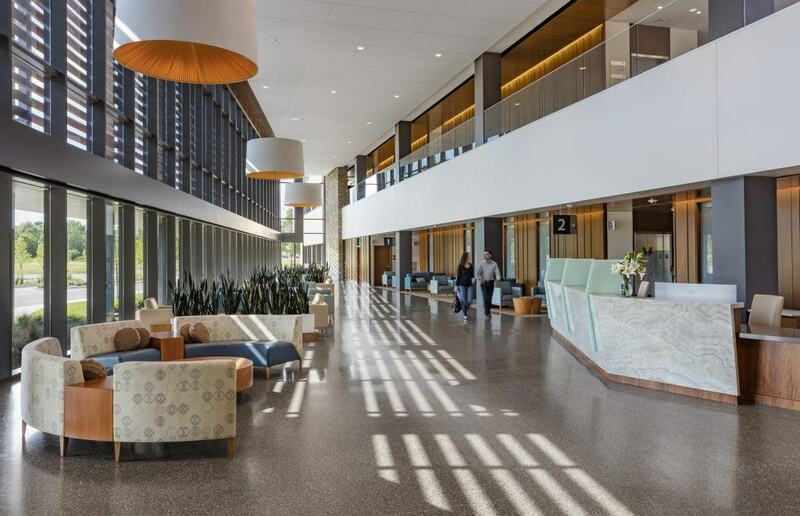 This emphasis on patient-focused wellbeing drove the planning and design of ThedaCare Regional Cancer Center in Appleton, Wisconsin. Connected to an existing ambulatory care center on a 53-acre campus, the 84,000-square-foot, two-story Cancer Center designed by HGA integrates state-of-the-art diagnostic, treatment, radiation and infusion services with wellness programs that address a range of physical, nutritional and emotional needs to support wellbeing. Collaboration, in fact, drove the planning process from the start. ThedaCare started with a survey to 450 patients, caregivers and family members to learn about services and amenities they wanted under one roof. ThedaCare and the planning team followed-up with a series of visioning sessions with staff and caregivers to identify milestones in the patient and family journey, and then refined their research and conceptual plans through feedback from seven town-hall meetings throughout the Fox Valley region. Yet some of the most personal insight came from an unexpected source. 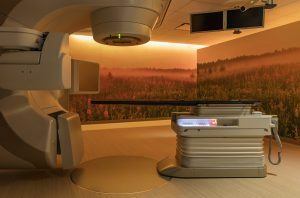 A board member from the ThedaCare Foundation approached the planning team when he learned about the new Cancer Center. His wife recently had died from cancer, and he offered to share his first-hand experience from the patient and family perspective. He soon joined the planning team as a Patient Advocate and participated throughout the development process. His input included a need for high ceilings, natural light, connection to nature, clear wayfinding, a variety of seating choices, places of respite, and even personalized concierge service. He clipped images of spaces he liked—hotel lobbies, seating arrangements, outdoor spaces. He even did “sit tests” when selecting new seating that surpassed the standard institutional furniture. He also noted that his wife often was as concerned about his comfort as she was about her own. This information resonated with the design team and informed them that a cancer center is as much about the family as it is about the patient. The design process proceeded with both in mind. 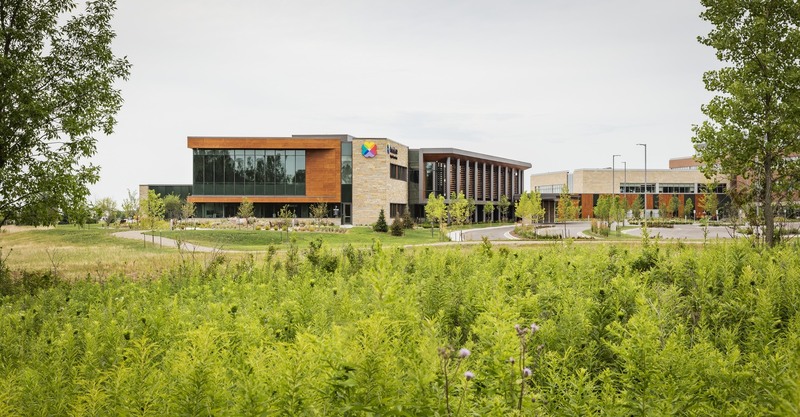 Open and connected to nature, the Cancer Center projects a positive and welcoming image to the community. Materials and textures humanize the building scale with a rhythmic pattern of natural stone quarried from nearby Fond du Lac, natural wood that adds warmth and beauty, abundant glass that increases natural light, and metal panels that add architectural accents. The lush campus features meadows, wetlands, forest, seasonal plantings, walking paths, and courtyards. Patients approach along an entry drive toward a canopied drop-off, where an assigned greeter meets them and their family. Inside, the main atrium suggests a well-appointed hotel lobby instead of a hospital setting. Inspired by the landscaped site, the palette is familiar to the community and rooted in nature, linking the interior to views beyond. Natural quartzite along the registration desk, a textured wood wall unifying the first and second level and a monumental staircase illuminated with a yellow back-painted glass wall give an impression of quality care. Custom pendants above a variety of seating areas reduce the scale of the two-story atrium, while built-in planters create privacy and reinforce the theme of bringing nature inside. The core of any cancer center is the treatment spaces, and this is where the Patient Advocate most specifically influenced design choices for the clinical spaces on the first floor. 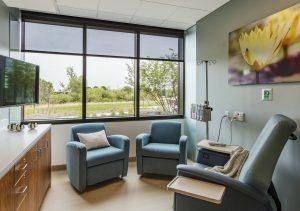 As such, ThedaCare added opportunities for positive distractions and “wow” factors, such as a decorative glass bead ceiling treatment with specialty lighting, a private Infusion Courtyard with expansive views of nature, options for private and communal infusion bays depending on patients’ daily condition, and additional seating and tables for family members. And one added benefit—a therapy dog that visits patients once a week to brighten their experience with the simple wag of a tail. There are days, Novenski noted, when he can hear laughter coming from the infusion bays, and that is when he knows the amenities are working. While radiation requires lead walls—not glass with views—the team answered the request by wrapping the windowless walls in panoramic regional nature scenes of meadows, lakes and forests and adding colored LED lights that allow patients to control the light level and color preference. 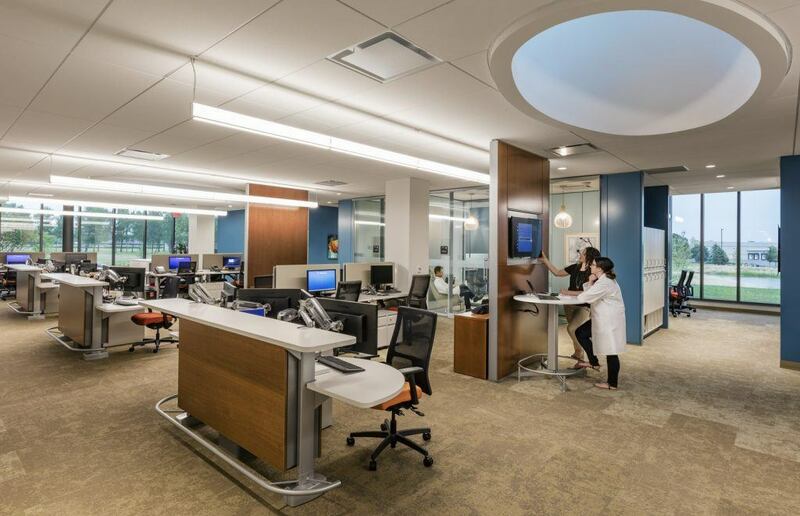 The design of the physician workspaces was central to achieving ThedaCare’s collaborative care model—and ultimately promoting a positive patient experience. From the start, physicians, staff and specialists were involved in the planning discussions. Three components of the workspaces support collaboration. The Exam Corridors connect to an open workspace with collaboration stations immediately off each corridor to facilitate interaction between the physician and his/her clinical team. Each exam corridor represents a cancer care specialty (Medical Oncology, Multi-Disciplinary/Internal Medicine, Radiation Oncology). The Collaboration Space is inspired by corporate workplace research. The open workspaces include sit-to-stand workstations, furnishings and space types that support focused, collaborative and nomadic work styles. Furniture solutions, such as architectural walls, flexibly reconfigure to accommodate the latest technology and work styles. The space also includes several enclosed rooms with glass fronts for concentrated work or quick confidential discussions, small 6′ x 9′ glass-front private offices for each physician for focused work at the end of the day, quiet spaces away from the open plan for respite, and a café. Expansive views to wetlands and sculptural skylights provide daylight and reconnect staff to the site and nature, supporting their wellbeing. The Exam Rooms (larger than standard at 170 square feet each) allow multiple providers to meet with the patient and family simultaneously. Video conferencing technology encourages long-distance relatives to participate in the care planning. Wellness programs are another key part of the Cancer Center. The central staircase’s yellow backdrop is visually uplifting as patients travel to the second floor for cosmetology services, cooking/nutrition classes, and proposed regular programming in yoga, massage, art, and music. 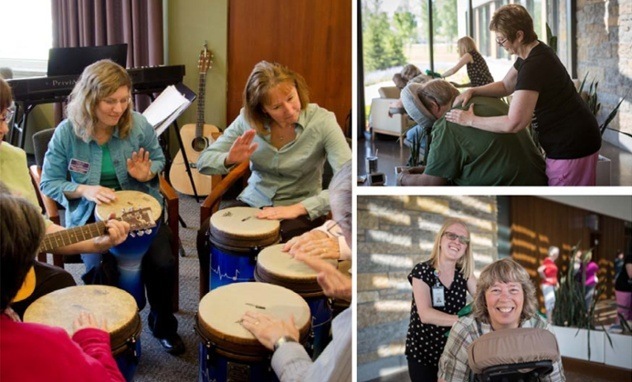 The wellness programs are part of ThedaCare’s holistic approach that addresses mind, body, and spirit. The main lobby and front courtyard, for instance, often serve as settings for special events, while cooking classes held in a kitchen upstairs address healthy diets for survivors and those currently receiving treatment. ThedaCare’s approach to cancer care informs a national dialogue on collaborative, patient-centered care. Emotional wellbeing is an important part of the healing process, as evidence-based design research indicates. Since opening in February 2016, the Cancer Center has attracted other national healthcare organizations, who have visited the campus to observe ThedaCare’s delivery model. Moving forward, cancer centers have the enviable challenge of integrating more programs for survivors. While there is a steady increase of new cancer diagnoses annually, the survival rate is rising because of better research, better treatment, and better screening. Cancer centers of the future will holistically meet the needs of both the patients and the survivors—creating places that celebrate life.